032 | The Great Adventure's of Cubicle Bear! Spacebear can hear the battle sounds of Dino and the giant platypus coming from his headset. Something has gone horribly awry! He tries to refresh his satellite imagery when a frightful image pops into view! 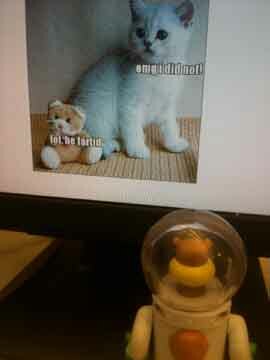 LOLcats?!? Spacebear recoils. Spacebear (into his headset mic): This is Spacebear, come in IB. I think we got a problem here. A native has taken over my surveillance headquarters. Abort mission. I repeat, abort mission!